Welcome back! Till now, in the AVR Timers, we have discussed regarding the timer concepts, prescalers, interrupts, ctc mode, etc. Refer to the following tutorials for them. In this tutorial, I will introduce you to another mode of AVR Timers – PWM Mode. Let us assume that a DC motor is connected to the power supply as follows. The motor is rated 12V/300rpm. This means that (assuming ideal conditions) the motor will run at 300 rpm only when 12V DC is supplied to it. If we apply 6V, the motor will run at only 150 rpm. For more details regarding controlling DC motor using AVR, view this. Now let us provide the following signal (12V DC) to the motor. The motor will rotate at 300 rpm. Now let us change the voltage level as follows (6V DC). We find that the motor rotates at 150 rpm. Now let us change the voltage level once again as follows (0V DC). This time, unsurprisingly, the motor doesn’t run at all. Okay, so let’s make it more interesting. What if we provide the following supply to the motor. Well, each and every body in this world has some inertia. Say the motor above rotates whenever it is powered on. As soon as it is powered off, it will tend to stop. But it doesn’t stop immediately, it takes some time. But before it stops completely, it is powered on again! Thus it starts to move. But even now, it takes some time to reach its full speed. But before it happens, it is powered off, and so on. Thus, the overall effect of this action is that the motor rotates continuously, but at a lower speed. In the above case, the motor will behave exactly as if a 6V DC is supplied to it, i.e. rotate at 150 rpm! Okay, so now, let’s modify the signal as follows. Now what happens? Yes! You guessed it right! (I hope so ;)) Since the on-time is less than the off-time, the effective speed of the motor reduce. In this case, the speed becomes 75 rpm (since off-time = 3 times on-time, i.e. speed = 300/4 = 75 rpm). 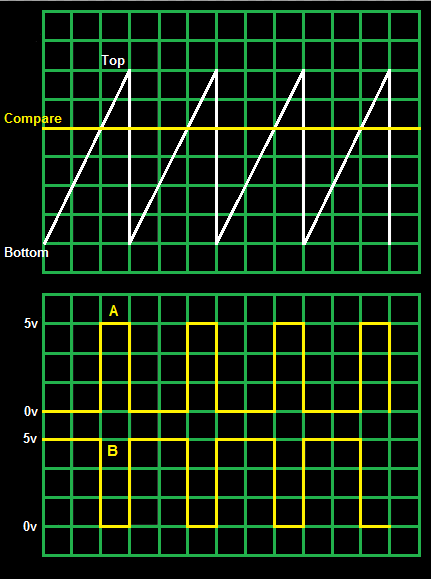 This is what we call Pulse Width Modulation, commonly known as PWM. PWM stands for Pulse Width Modulation. It is basically a modulation technique, in which the width of the carrier pulse is varied in accordance with the analog message signal. As described above, it is commonly used to control the power fed to an electrical device, whether it is a motor, an LED, speakers, etc. 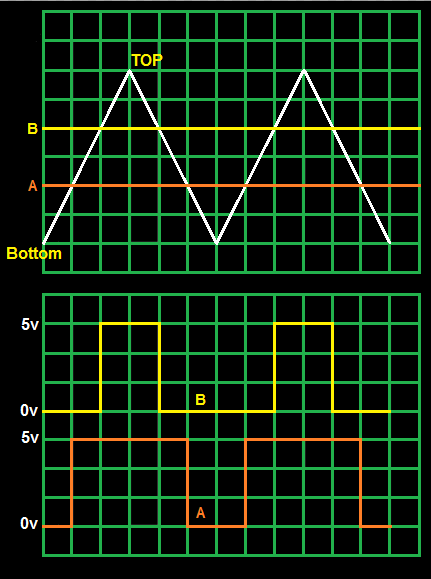 The simplest way to generate a PWM signal is by comparing the a predetermined waveform with a fixed voltage level as shown below. Inverted Mode – In this mode, if the waveform value is greater than the compare level, then the output is set high, or else the output is low. This is represented in figure A above. Non-Inverted Mode – In this mode, the output is high whenever the compare level is greater than the waveform level and low otherwise. 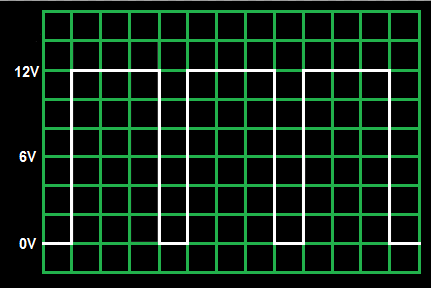 This is represented in figure B above. Toggle Mode – In this mode, the output toggles whenever there is a compare match. If the output is high, it becomes low, and vice-versa. But it’s always not necessary that we have a fixed compare level. 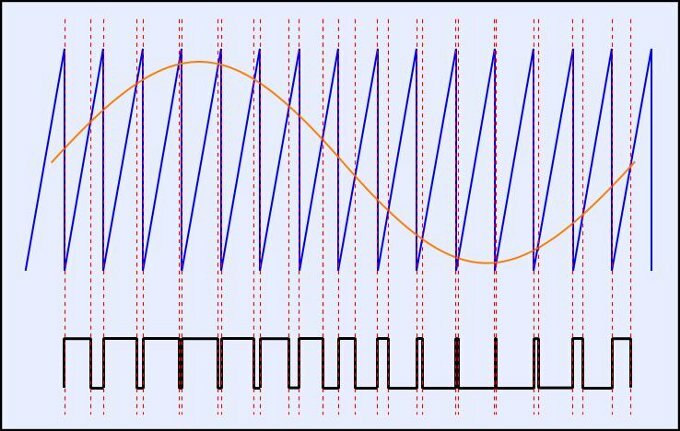 Those who have had exposure in the field of analog/digital communication must have come across cases where a sawtooth carrier wave is compared with a sinusoidal message signal as shown below. PWM can also be generated by making analog circuits like the one described here. This is clarified in the following diagram. In this section, we will revise some important and necessary concepts related to timers. 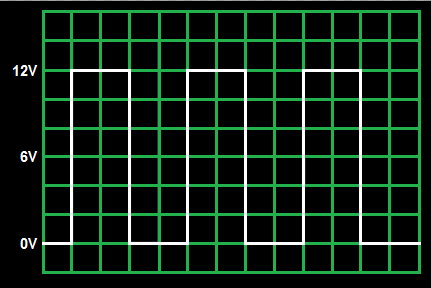 Consider the following timer diagram. We are very well aware that the AVR provides us with an option of 8 and 16 bit timers. 8bit timers count from 0 to 255, then back to zero and so on. 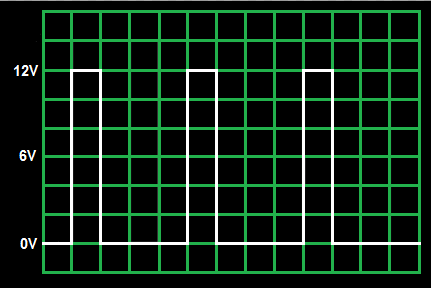 16bit timers count from 0 to 65535, then back to zero. Thus for a 8bit timer, MAX = 255 and for a 16bit timer, MAX = 65535. The timer always counts from 0 to TOP, then overflows back to zero. In figure A shown above, TOP = MAX. Now, I guess you all are familiar with timers in CTC Mode, in which you can clear the timer whenever a compare match occurs. Due to this, the value of TOP can be reduced as shown in figure B. The yellow line shows how the timer would have gone in normal mode. Now, the CTC Mode can be extended to introduce variable TOP as shown in figure C (however there isn’t any practical utility of this). TOP never exceeds MAX. TOP <= MAX. Now that you are aware of the terminologies of TOP, BOTTOM and MAX, we can proceed to the different modes of operation. In simple terms, this is Fast PWM! 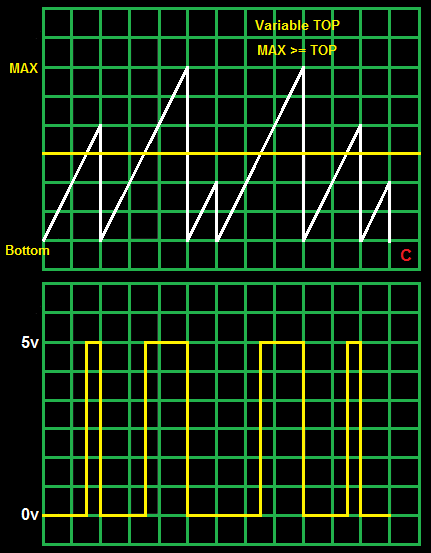 We have a sawtooth waveform, and we compare it with a fixed voltage level (say A), and thus we get a PWM output as shown (in A). Now suppose we increase the compare voltage level (to, say B). In this case, as we can see, the pulse width has reduced, and hence the duty cycle. But, as you can see, both the pulses (A and B) end at the same time irrespective of their starting time. 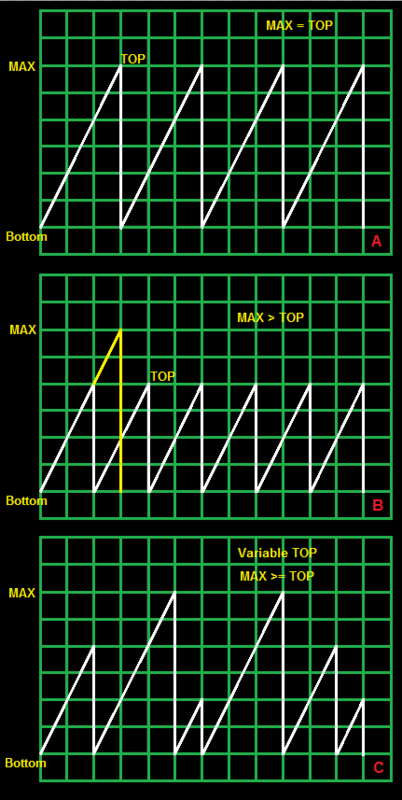 In this mode, since sawtooth waveform is used, the timer counter TCNTn (n = 0,1,2) counts from BOTTOM to TOP and then it is simply allowed to overflow (or cleared at a compare match) to BOTTOM. Now have a look at the following diagram. Here instead of a sawtooth waveform, we have used a triangular waveform. Even here, you can see how PWM is generated. 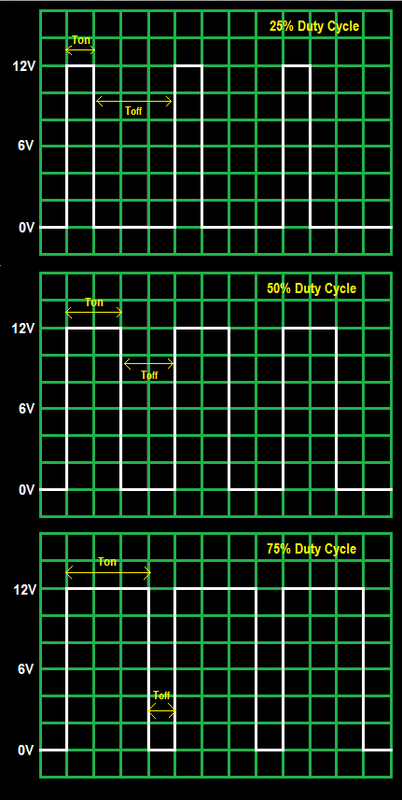 We can see that upon increasing the compare voltage level, the duty cycle reduces. But unlike Fast PWM, the phase of the PWM is maintained. Thus it is called Phase Correct PWM. By visual inspection, we can clearly see that the frequency of Fast PWM is twice that of Phase Correct PWM. Technically, Phase Correct PWM and Frequency and Phase Correct PWM are same if the TOP remains same. If we have a variable TOP, the frequency of the output wave will keep changing as shown below. The following illustration has a flaw (which one of my readers pointed out) that it basically represents a Fast PWM with variable frequency. Due to lack of availability of time, it is not possible for me to create another illustration. So, kindly bear with me. However, you can at least get the concept of variable TOP from the diagram. Thus, for this, we need Frequency and Phase Correct PWM. Since in most cases the value of TOP remains same, it doesn’t matter which one we are choosing – Phase Correct or Frequency and Phase Correct PWM. Which mode of operation to choose? Which compare output mode to choose? In AVR, PWM Mode is available in all timers. TIMER0 and TIMER2 provide 8bit accuracy whereas TIMER1 provides 16bit accuracy. In 8bit accuracy, you have 256 individual steps, whereas in 16bit accuracy, you have 65536 steps. Now suppose you want to control the speed of a DC motor. In this case, having 65536 steps is totally useless! Thus we can use an 8bit timer for this. Even 8bit is too much, but there is no other choice. Obviously there isn’t much difference in speed between 123/256th and 124/256th of full speed in case of a motor! But if you use servo motors, you have to use 16bit timer. More on that later. If you need quite high resolution in your application, go for 16bit timer. If you want to control the speed of DC motors or brightness of LEDs, go for any one of them. But if you are using it for telecommunication purposes, or for signal sampling, fast PWM would be better. For general applications, phase correct PWM would do. Out of the three modes, inverted, non-inverted and toggle mode, non-inverted mode is the most reasonable. 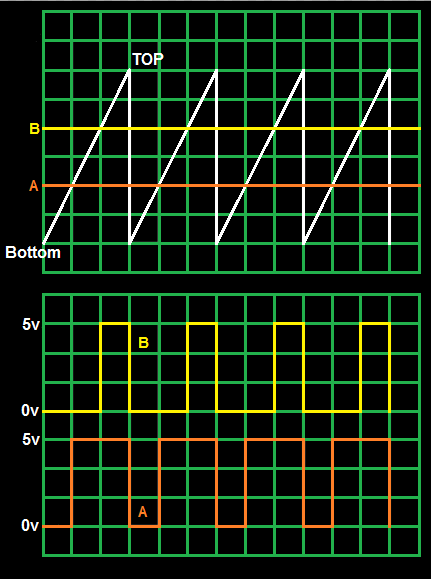 This is because upon increasing the compare voltage, the duty cycle increases. However, you can choose any of them. Regarding toggle mode, I wonder if there is any practical application of it. So this is it! In the next post, we will learn how to implement it in AVRs! So till then, catch up with me by subscribing to my blog or by grabbing RSS Feeds! And don’t forget to post your comments! 🙂 Enjoy! Hey Max, did you ever finish your Part two tutorial? If so, send me a link! I would be ecstatic to read it! My apologies, I just finished reading part two… Great job Max, thanks again! can a variable voltage get generated from a variable frequency?